The Daily Dimwit: Trades, purchases, breaks and just because! Ok, so these are all "set-completion" cards. The first two finish off SP Authentic 2007 for me. 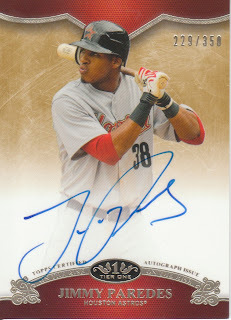 The Marx finishes off 2011 Goodwin Champions base/SP set (I still need inserts!!!). 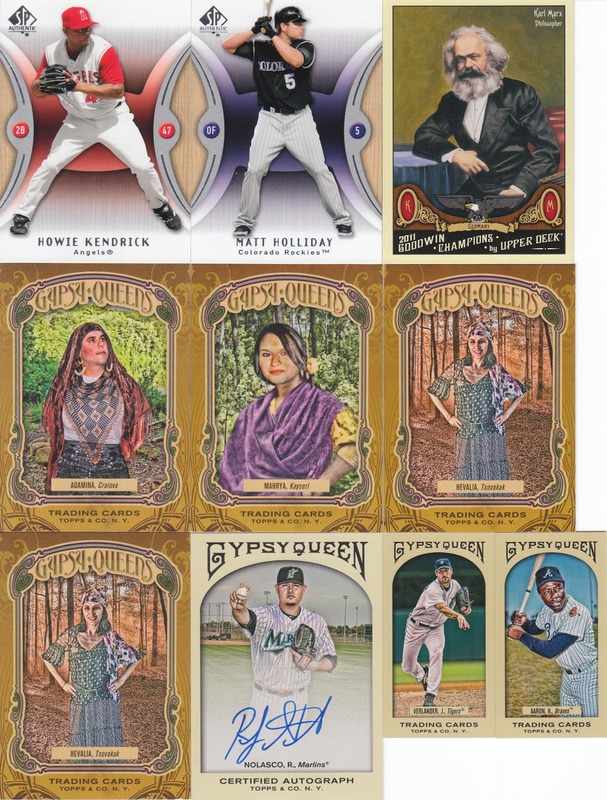 The Gypsy Queens fill in some holes, I need more though, need list on the right sidebar!! Finally I have a GQ Auto and a couple of mini's. I still have 9 GQ REGULAR BACK mini's from last year's set that I need. Please, if you have any sitting around, please take a look and see if you can help. I will trade VERY generously for any of these 9!!!! The last card in the COMC package was this beauty! BA Benny basically announced his return to the blog-o-sphere during our trade negotiations over this card. It was the last one I was chasing for my mini relic set and he graciously traded it to me knowing I needed it. 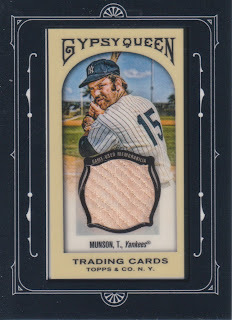 Anyways, most of the time these were going in the $60 to $80 range on eBay as Munson, Ruth and Gehrig were the C Group of relics from GQ and were very hard pulls. The price apparently is starting to go down as there is one on e-bay with a BIN of $27.50. Anyways, I picked this one up for less than the cost of a blaster and hope to trade it back to BA Benny if he still wants it. 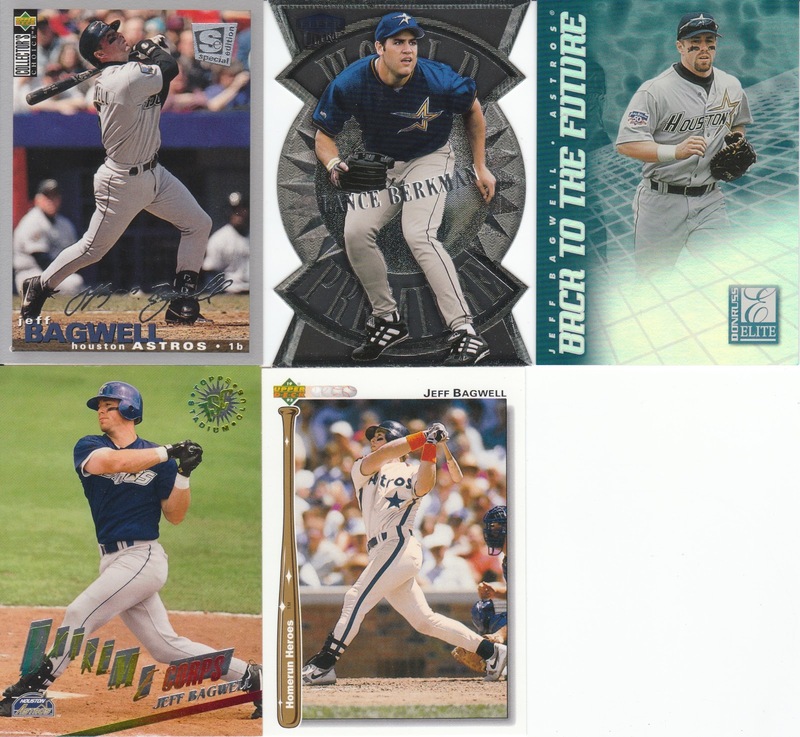 Next up, I have a trade with The Diamond King... he apparently has a pipeline for ridiculously awesome Astros cards... I owe him something for this trade, I just have to find something that fits in his wants! 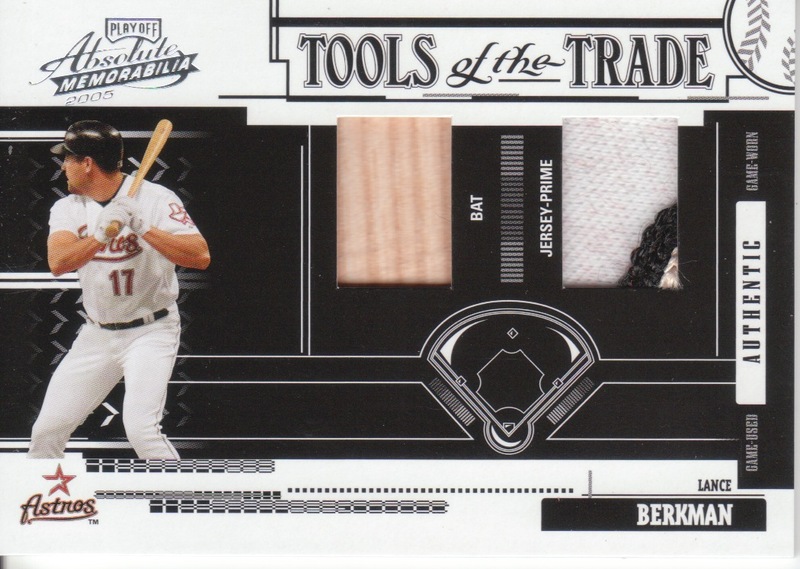 An AWESOME Berkman dual relic with a piece of patch! Thanks Kevin!!!! 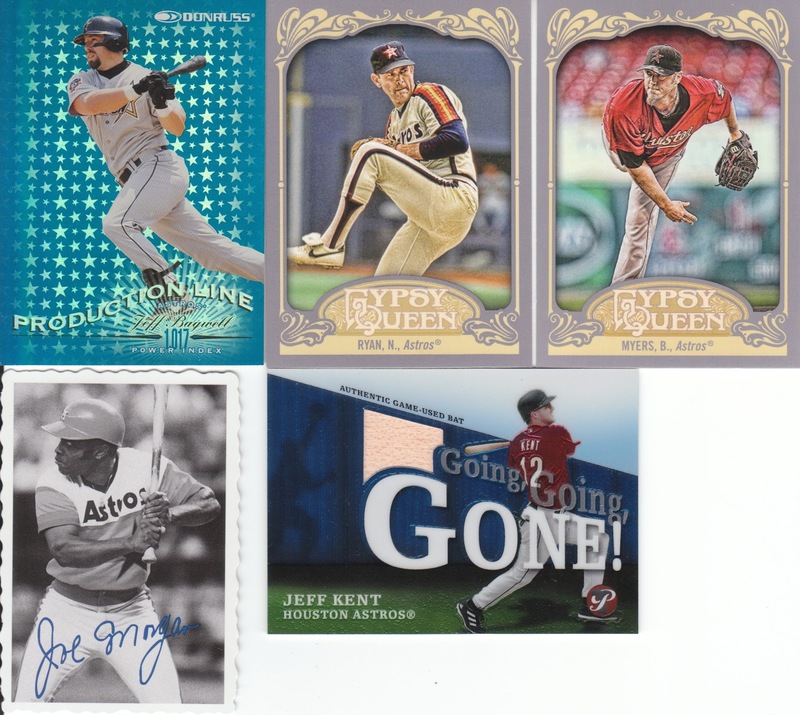 Next up is group break loot from Kyle over at Jabo's... another great group break by Kyle and I got a very nice Jeff Kent relic from Pristine. 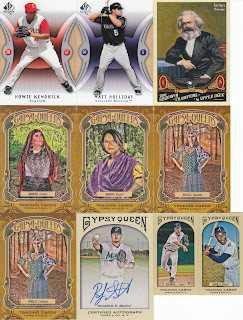 That's an awesome looking set, I may have to do a box in one of my breaks (I know I say that a lot!). 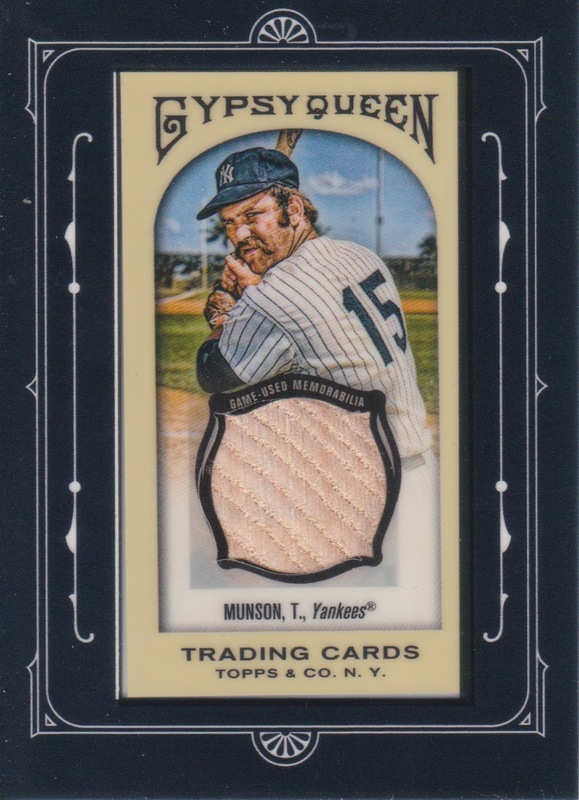 Finally got a deckle edge Morgan too! Finally, Martyn over at Cards Beyond Oceans sent over an awesome "Just because" package... because he's awesome! He got the Astros in a group break and ended up with the great card below! He also sent a relic of "The Player Who Shall Not Be Named - and is currently a Marlin" that will go in my For Trade list... but the Paredes auto is AWESOME!!!! They have moved him to the outfield after he struggled at 3B this year in hopes of finding a place for him on the ML roster next year. He's got tons of potential, just got to find a position for him since it doesn't look like Altuve is going to budge from 2B any time soon! As for my beloved Astros, we fired half the coaching staff last night in what I thought was a rather un-professional manner. The players found out via Twitter apparently. In my opinion you hold a team-only meeting after the game and explain what's going on. Not wait until everyone has left the ball park and send out word through the media that Mills and Co. have been fired. Anyways, the interim manager will have limited, if any, success at changing the losing ways this year. We're rebuilding and part of that is a lot of pain involved with watching young players struggle and Jordan Lyles give up 9 runs in an inning. It will get better, but I'm not thinking "competitive" is going to be a goal for another 5 years as the move to the AL is only going to make the rebuilding more challenging. Bud Selig: SCREW YOU, I hate you and will always hate you, there is no redeeming quality about you. You've treated Houston like a red-headed step child for years and many of us Houston fans feel towards you like a step-child might feel towards an abusive step-father. You're an idiot, you wield too much power and you used leverage against Crane in the sale to force this upon not only him as an owner, but on us as fans. I could care less about our "rivalry" with the Rangers. I am going to greatly miss our actual rivalry with the Cubs, Cardinals, Braves, Dodgers, and Mets that we've had through the past 50 years. I'm rambling and angry, I probably should go eat some breakfast. You may be rambling, but you're exactly right. Return the Brewers to the American League, Selig! You know it's right. Glad you like the Paredes! 1) The Berkman double relic is pretty neat. 2) Brad Mills never had a chance. He was playing a major league schedule with a AAA team. He's too good a baseball man not to land on his feet. And in typical Mills style all he wanted to talk about were the two coaches that were canned with him. Being here in Houston I try really hard to root for them but they make it pretty tough with this sort of thing. It's like a shipping company sending out a leaky boat then firing the captain as the water reaches the deck. He's better off on the raft than the ones left behind. Fourth largest city in America and Milwaukee gets all the special treatment. Stupid. I'll be happy to have the Astros in the American League. I've always liked them and now I can see them when they come to KC. I agree it should have been the Brewers changing back to the AL. Since we've had interleague play forced down our throats, the Houston/Texas rivalry has a place. Forcing them to change leagues is just another example of Selig's f'ed up "legacy".